Much has been written about the archive and its role in defining history. Photography as a medium has been used to document and archive boundless topics, from the microscopic to the macroscopic. Many artists use the photography of others as the source material of their work. Some photographers create new work through organizing and documenting existing non-photographic collections and archives. Both ways of interacting with the archive deepen the viewer’s insight into the formal organization of material used to preserve the past — recollecting history. Sutro Library’s exhibit explores the image as artifact. Prior to photography, the eager public relied on master illustrators and artists to provide visuals showing the animals, people, places, food, temples, rivers and cities of faraway lands. 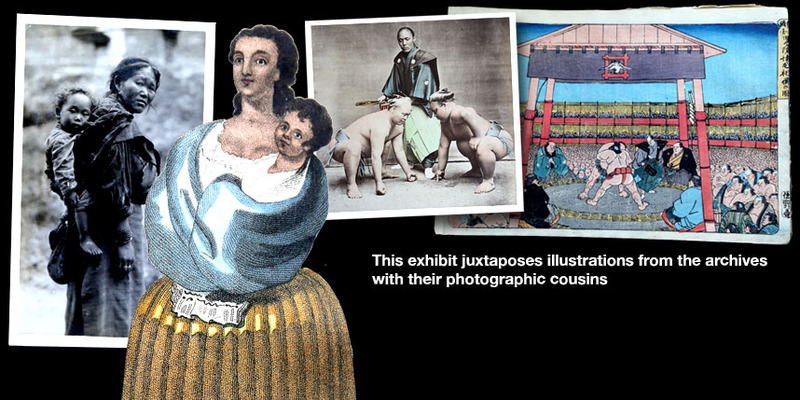 Sutro’s exhibit juxtaposes early examples of illustrated travel narratives of Mexico, Peru, India, Egypt, Japan, Florida, and Cuba with their photographic cousins. This exhibition is supported by the University's Instructionally Related Student Activities Fund. Artists: Chris Dorosz, Ian Everard, Doug Hall, Hung Liu, Kija Lucas, Sean McFarland, David Pace and Stephen Wirtz, Nigel Poor, Dina Rubiolo, Pamela Wilson Ryckman, Tina Takemoto, Catherine Wagner.